Sunday March 25th 1902 It was a pleasant morning and I was busy about the work and read a little. John & Hatt were here a few moments in the afternoon. I went down to church after they were gone. Mollie came back at night and told us about Johns wedding yesterday to a sister of Allie Ott at Riverdale. I read all the evening. Monday March 24th 1902 Terry churned for me early. Will and him went down to Woolfs for some cattle he had bought. I washed some and in the afternoon went to town. I stopped at home with butter for the folks, was at Woolf a few moments. Tuesday March 25th 1902 I did my ironing this morning. Will went to town and brought Mother out. It was a nice day. We had a good visit and Mollie took her home after school. Will sold Bird mare to Mr Franklin this afternoon. 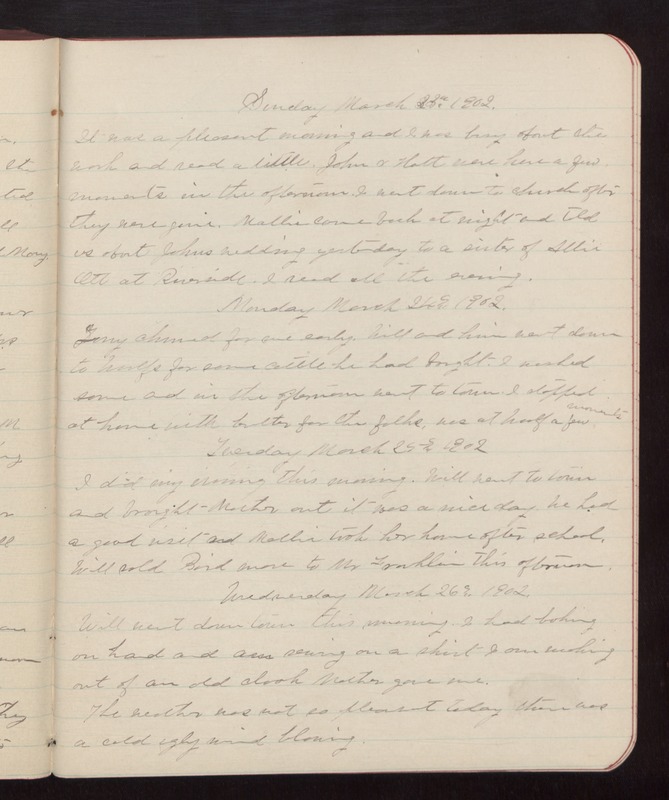 Wednesday March 26th 1902 Will went down town this morning. I had baking on hand and was sewing on a shirt I am making out of an old cloak Mother gave me. The weather was not so pleasant today. There was a cold ugly wind blowing.